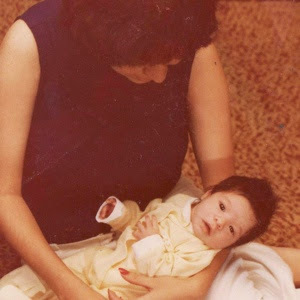 So 39 years ago on the first day of summer June 21, the world welcomed a beautiful brown eyed little girl with a full life ahead of her..
Over the course of my 39 years of my life on this earth, I have accomplished many things that I said I would do so far in my life. Which I am so grateful that my mom always encouraged me to dream big and accomplish anything with Jesus beside me. When I was 16 years old in the early 90s while visiting my Mamá (what we called my Spanish Grandmother - my Mom's mother) my brother and I had been given the chore of going to do the laundry at the laundry mat. My Mamá lived in the Flatbush area of Brooklyn, NY. We had tons of laundry to do and knew it be a whole day event. So we got the laundry started and I went to sit down and there was a women in her mid to late 50s who had the horned rimed glasses with a tinge of gray. She was dressed in a retro floral smock apron with a cotton blue dress underneath. She was sitting with her arms folded watching the little tv in the corner hanging from the ceiling. She seemed a little startled, but said "hi' with a strong New York accent. I proceeded to chit-chat with her and learned over the course of our conversation that she was a single woman who lived with her mother and had never been out of the Flatbush area of Brooklyn. I asked her why she never wanted to go see the Statue of Liberty or Time Square or other national landmarks just a train ride away. "There's so much to see in the world beyond Brooklyn" I exclaimed. She then said something that I will never forget, "Everything I need is here, my work, my family, grocery stores in every Block. I never saw the need to see the world when everything I need is right her." In shock I asked, 'So you never wanted to go to Europe or even the beach in Atlantic City?" I told her about my travels to that pint going back and forth between Texas and Pennsylvania , New Jersey & New York by trains, planes & automobiles. I told her that I was going to Jamaica with my Church at the end of summer. I also told her how I planned to go to college in Minnesota and one day visit every country I could. She was amazed at all I had visited so far and I was shocked how she never traveled anywhere in her whole life. 7. Finish my college degree. I have one class to complete. I'm sure I have more but as I think iPod them I will add :) if you have any recommendations please share! I believe this year is my year of fulfillment and I'm standing on that as my promise. God have your way mold me and make me into the woman you created me to be!